Chivalry Today: You Made This Possible! The interpreters from Chivalry Today let students get up-close-and-personal with some medieval armor at a campus Renaissance Faire in La Mesa. Well, as you undoubtedly know, there’s a lot more to Chivalry Today than our ever-growing website. And although our podcast has more than 5,000 listeners worldwide, that’s not all there is to our program either. 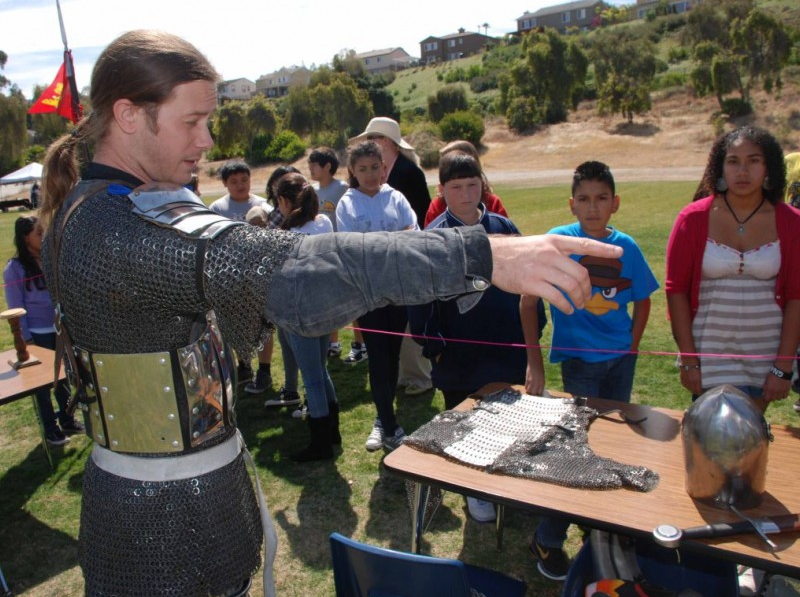 In fact, each year Chivalry Today provides dozens of educational lectures, displays, and interpretative activities at schools, libraries, and camps throughout Southern California. But, as you can certainly imagine, in today’s economy, not every school has the budget to bring in a crew of trained interpreters, craftspeople, and historians to give their students the sort of experience that can make medieval history come to life – and highlight the values of chivalry and honor in a way that makes them relevant and applicable in the world of the 21st century. Scott Farrell shows students the workings of a 15th century helmet called a sallet. That’s where our donors come in. Everyone who has made a contribution to Chivalry Today through our website in the past year has helped make it possible for our program to provide our award-winning educational presentations to several school districts serving low-income students for no cost, or for a reduced fee schedule. 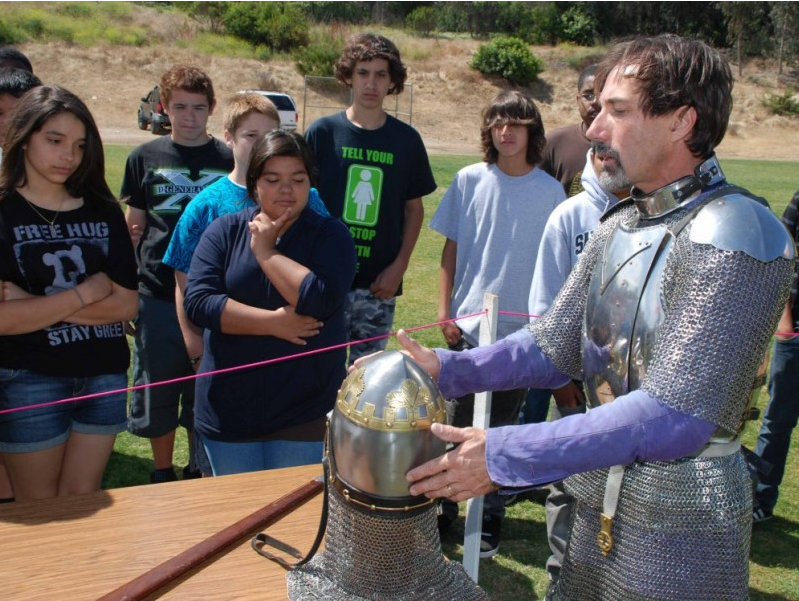 Yesterday, June 1, Chivalry Today provided it’s final interpretative demonstration of the 2010/11 school year at a middle school in La Mesa, California, as part of the all-campus Renaissance Faire. You, our generous donors, made it possible for Chivalry Today to provide that school with a display of medieval arms and armor, and our exciting Deed Of Arms presentation, even though the school’s social studies department was operating on a severely reduced budget. So – take a look at all the smiling faces in the accompanying photographs, which appeared in the local news website The La Mesa Patch. Those grins and joyful looks are the result of your generosity – and they’re our way of saying thanks to those of you who have been generous enough to support Chivalry Today with a financial contribution. 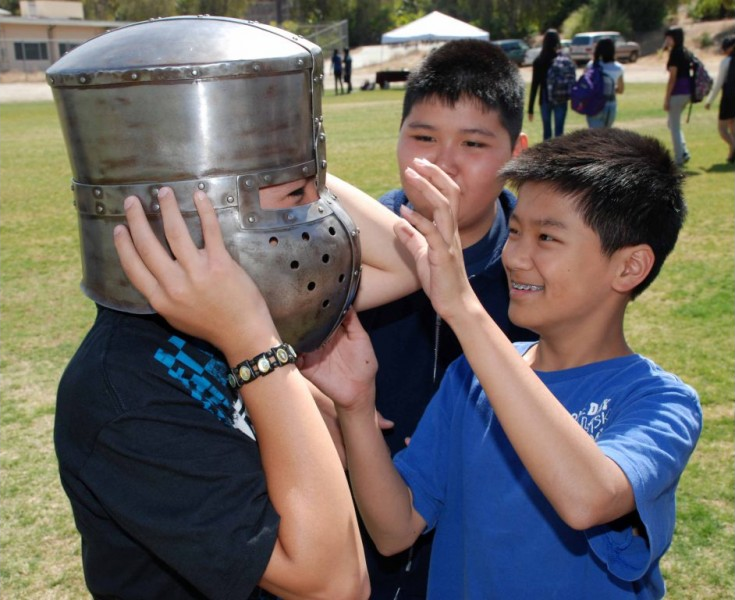 Even a 12th century knight’s helmet can’t hide a student’s smile! Although this school year is winding down, Chivalry Today is already scheduling presentations and demonstrations for the fall season! If you are (or know) a teacher who’d like to bring one of Chivalry Today’s engaging presentations to your classroom or campus, please contact us soon! And if you’d like to support our educational outreach program in an effort to bring an appreciation of historical studies and the values of chivalry, please take a moment to make a contribution of any size to support Chivalry Today. We know quite a few students who’ll be very glad that you did!